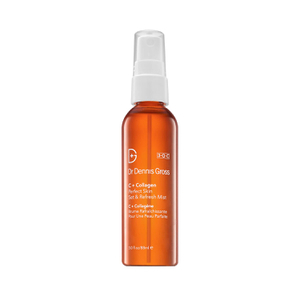 Receive a FREE Free Collagen Perfect Skin Set & Refresh Mist when you spend £125 on Dr Dennis Gross Skincare. 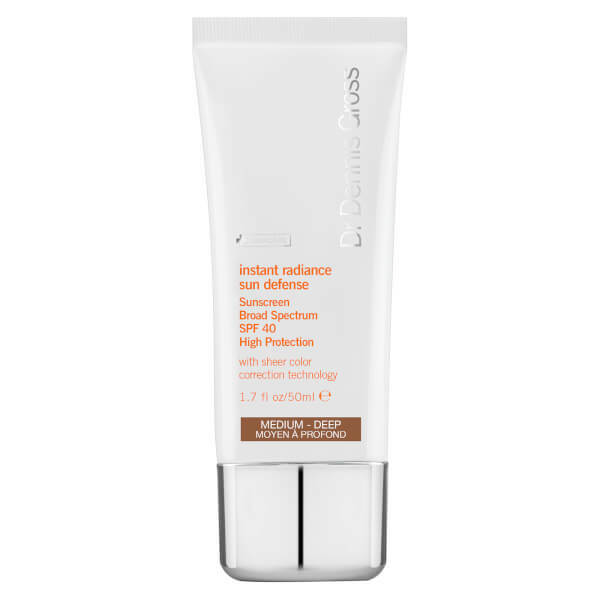 Restore a radiant, healthy-looking glow with Instant Radiance Sun Defense SPF 40 from Dr Dennis Gross. Fortified with innovative Pigment-Adaption technology, the tinted moisturiser blends with individual skin tone for a natural-looking finish. 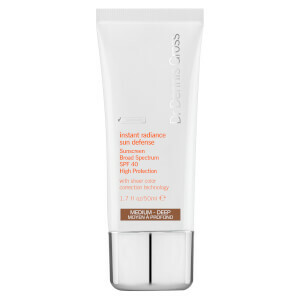 Harnessing the powers of a Color-Correcting Complex (comprising Vitamin C, Melatonin, and colour expert actives), the lightweight formula conceals the appearance of imperfections, redness and discolourations, whilst Zinc Oxide provides broad spectrum protection to defend against harmful UVA/UVB rays and premature ageing. Combats dull, lack-lustre skin to leave your complexion smooth and flawless with restored luminosity. Ideal for medium/deep skin tones. Vegan. Paraben, phthalate and animal cruelty free. Use daily in the AM as the final step in your skincare routine. Start with clean, dry skin. Apply liberally over face, neck, and décolleté 15 minutes before sun exposure. Apply second layer for full coverage. Water, Glycerin, Butylene Glycol, Isononyl Isononanoate, Pentylene Glycol, Carthamus Tinctorius (Safflower) Seed Oil, Olea Europaea (Olive) Fruit Oil, C12-15 Alkyl Benzoate, Coconut Alkanes, Hydroxyethyl Acrylate/Sodium Acryloyldimethyl Taurate Copolymer, Ascorbyl Glucoside, Melatonin, Tetrahexyldecyl Ascorbate, Tocopherol, Tocopheryl Acetate, Nordihydroguaiaretic Acid, Sodium Hyaluronate, Palmitoyl Tripeptide-38, Echium Plantagineum Seed Oil, Oenothera Biennis (Evening Primrose) Oil, Boerhavia Diffusa Root Extract, Phospholipids, Sphingolipids, Saccharide Isomerate, Citrus Aurantium Dulcis (Orange) Flower Extract, Glycolic Acid, Sodium PCA, Oleanolic Acid, PEG-60 Almond Glycerides, Hydrogenated Lecithin, Acrylates/Carbamate Copolymer, Bis-Ethylhexyl Hydroxydimethoxy Benzylmalonate, Coco-Caprylate/Caprate, Aluminum Hydroxide, Xanthan Gum, Citric Acid, Disodium EDTA, Hydroxypropyl Cyclodextrin, Sodium Citrate, Caprylyl Glycol, Isohexadecane, Polyhydroxystearic Acid, Sodium Hydroxide, Tromethamine, BHT, Polysorbate 60, Carbomer, Isopropyl Titanium Triisostearate, Sorbitan Isostearate, Stearic Acid, Benzyl Alcohol, Phenoxyethanol, Potassium Sorbate, Sodium Benzoate, Citrus Aurantium Dulcis (Orange) Oil.